New packages for the Robot Operating System (ROS) are available for autonomous exploration of unknown environments using collaborating mobile robots equipped with cameras. The software offers wireless ad hoc communications between robots, merging of maps from different robots, and coordinated selection of exploration frontiers. A prototype with four robots was built that demonstrates its functionality in an indoor environment. There is a broad spectrum of applications for mobile robots exploring unknown environments, including planetary exploration and support of first responders after a disaster. Torsten Andre and students at the University of Klagenfurt developed and implemented ROS packages for this purpose. A key feature is that multiple robots act as a team and collaborate to speed up the exploration. The software is available for download under BSD licensing. 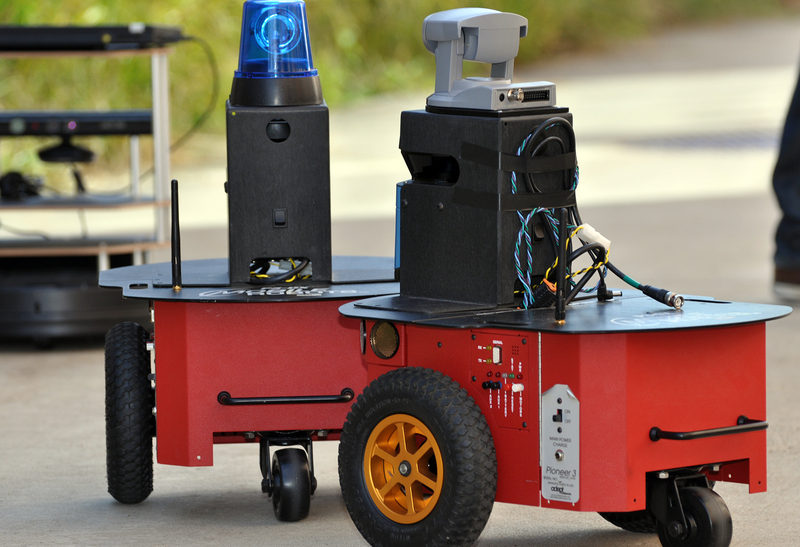 The ad hoc communications package enables robots to wirelessly communicate with each other. It does not rely on any preexisting network infrastructure but lets robots exchange data directly. A map common to all robots is required to allow common understanding of the coordination. This task is achieved by the map merging package. «Our communication modules are used to exchange local maps produced by robots and to merge these local maps to a common global map,» Andre says. Together with a novel package for exploration, a tightly integrated software solution for coordinated multi-robot exploration is offered. «We tested the software on Turtlebots and Pioneer3-DX robots and now invite other researchers to use and further improve the implementation,» Andre concludes. The following video shows the multi-robot exploration system in operation. The video has been nominated for the finals of the 2015 AAAI video competition. The system is further described and evaluated in the paper “Coordinated Multi-Robot Exploration: Out of the Box Packages for ROS“, which was presented at the 2014 International Workshop on Wireless Networking and Control for Unmanned Autonomous Vehicles in Austin, TX, in December as part of the IEEE GLOBECOM conference. The work was supported by Lakeside Labs GmbH with regional and European funding.